"I answer to God's law, not Roman." Today, we take the freedom of personal thought for granted. During the 16th century, the time of Martin Luther, the Roman Catholic Church dictated the precepts to be followed. Only Church officials and those in authority were allowed to read Scripture, and their interpretations were frequently bent in favor of maintaining the structure of power, the very glue that held together pre-Enlightenment Europe. The common people had no knowledge of such things, for lay people were alive to obey, not to think. Unfortunately, the will of men easily corrupts that which is holy. Pope Leo X, out of a desire to reform the Church by building St. Peter's Cathedral in Rome, unleashed a new campaign for indulgences, a common practice that fed off the ignorance of the people. For a small fee, you could buy your way into heaven. It was works and deeds that saved, not faith. Martin Luther, theologian and monk, knew there was something deeply wrong. The desire for power, order, and monetary acquisition was in the Church's highest interest, not the salvation or peace of its people. As Luther walked the streets of Rome, passing dealers selling nails from Calvary, bones of dead saints, and offering prostitutes to clergy, he saw the den of hypocrisy, and out of love for the Church had the courage to stand up against it. Nailing his "95 Theses" to the door of the Wittenberg church in 1517, he proclaimed his views. He denounced the use of indulgences and called for a return to the word alone, which preached that faith in a loving God, not works for a vengeful deity, led to salvation. Later, his work would put the word of God into the hands of the common man, translated into German, the language of the people. He waited for the backlash, which came in short order—Rome did not take this lightly, and Christianity seemed to be on the brink of self-destruction. Many films have attempted to dramatize the events of the Protestant Reformation, a time of great upheaval and change, the conflicts of which continue today. As a Lutheran, I hold to the teachings of Martin Luther, or more specifically, the truth they reveal about God's word. I have seen many a telefilm about the life of Luther in both Sunday school and theology classes. The quality varies. Biopics are always a challenge, and Luther is a fine attempt at depicting these times. I found it to be a flawed yet satisfying effort, constrained by its short running time and a second half that loses momentum when history suggests otherwise. Eric Till's film begins with Martin's lightning-induced commitment to God and his personal struggles with his faith. How can such a sinner possibly earn his way to heaven? He realizes he cannot without the help of God, and only grace, through faith in Christ, has the power to save. This time of inner turmoil is well done, carrying the appropriate dramatic weight and intensity. Though Joseph Fiennes does not seem to evoke the kind of personal prowess one would expect in Luther, he does an admirable job conveying the personal struggles, imperfections, and boldness of this important figure. At times, Luther was a deeply depressed, conflicted, self-abusive man, and his extreme moments are not overlooked (though accounts of him beating himself are widely known, but omitted here). Some have complained this is a weak and inadequate depiction of Luther, but he was, after all, only human. So far, so good. Once his confidence is gained through his meticulous study of the New Testament, Luther's writings, in tandem with the printing press, give the peasants of Germany new freedom, and the princes an opportunity for financial gain. The peasant's war is depicted on screen in graphic detail, though the film does little to explain what is going on—nothing here fills in all the blanks, and it is assumed you have some knowledge of these events throughout. 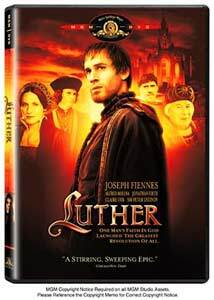 At the same time, the screenplay distracts the historically knowledgeable, glossing over some details, such as the princes' support for Luther not out of a pure desire for religious truth, but for personal gain and freedom from the financial constraints of the Catholic Church. Likewise, the peasants used Luther's writings as fuel for violent rebellion, distorting his teachings into justification for revenge. These issues are somewhat left behind, lost in the shuffle of a rushed second half. Regardless of the film's hurried pace and lack of depth, it does an admirable job of finding the heart of the Reformation, bringing it to life through some impressive production design, cinematography, and performances from a worthy supporting cast. Alfred Molina makes a brief, yet memorable appearance as Johann Tetzel, the Pope's collector of indulgences. In his final role, Sir Peter Ustinov brings a sense of wisdom to Prince Friedrich der Weise. Claire Cox makes a rather hurried appearance as Luther's wife, Katharina. Herself a runaway nun, the gravity of this rebellious marriage is not felt in the film. Visually extravagant and filled with impressive music, including some of Luther's own hymns, Till's Luther is technically proficient, but struggles to capture the complexity and scope of Luther and the Reformation. In a hurried ending that closes with a tidy text crawl, Luther comes to a halt, losing some of the depth and dimension such a film should have. Till's effort also fails to remind us of the Catholic Church's own positive reforms in light of the Reformation. There is more to be told. This is one of those rare instances where a film should be longer—Luther's important story, and the reforms that resulted, deserve it. Image Transfer Review: MGM's anamorphic transfer captures Robert Fraisse's memorable cinematography with great detail. Colors are bold and contrast is solid, which becomes useful during the film's moments of heavy shadow. Grain is minimal, and edge enhancement, or other digital issues, are nonexistent. Audio Transfer Review: The Dolby 5.1 audio is more dynamic than I expected. Though the majority is front centered, focusing on the dialogue, the surrounds kick in to support the aural environment. Ambiance is well rendered during key scenes, such as the film's many crowd sequences. Richard Harvey's impressive choral-heavy score has a fine presence throughout the entire soundstage, and the LFE kicks in whenever horses make an appearance. Like the film, the content of these bits are constrained by short running times. This is a missed opportunity to offer a more complete historical portrait of the Reformation. Eric Till's attempt at capturing the complexity of Luther's Reformation is technically sound, but struggles to find clarity and glosses over some important dimensions. This film needs room to breathe. Still, it remains an entertaining, informative, and relatively accurate look at these important events. MGM's disc is thin on the extras, but looks and sounds superb. I'm still going to recommended this one.